The “Every Journey Begins with A Single Step” Award goes to Mark, who tried to leave Bismarck on Friday, and had more travel trials than anyone should have to endure, finally arriving in San Salvador on Sunday night. The trip would not be the same without hard working Marco, so we were all glad to see him this morning. The “Give The Lady A Hand” Award goes to Ginger, who broke her hand in several places two weeks ago, yet still came on the trip and is working as hard as anyone. The “You Can Have The Clothes Off My Back” Award goes to Sandy B, whose luggage was misplaced in Denver, and has yet to be found. She has borrowed as needed from other team members, and carried on with incredible grace. The “Here We Go Again” Award goes to the 13 teammates who have been on multiple Thrivent Builds trips to El Salvador, especially our fearless leaders, Rita and Kai. The “There’s A First Time for Everything” Award goes to the four teammates who are making their first Thrivent Builds trip to El Salvador, all of whom have jumped in with open hands and open hearts. 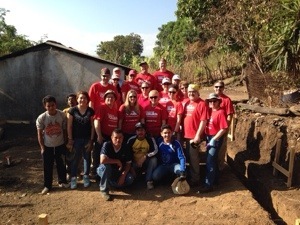 Our work today included all the things that are done on the first day at a new build site in El Salvador; clearing the site, digging the foundation, wiring rebar together, and moving tons of dirt, sand and rock one bucket at a time. Tomorrow we will break into two teams so we can work on another house. The Habitat El Salvador staff are, as usual, taking wonderful care of us. We send all of our love to our families and friends back home! This entry was posted on Tuesday, February 4th, 2014 at 7:32 am	and posted in Recent Sermons. You can follow any responses to this entry through the RSS 2.0 feed. « Greetings from El Salvador! Deseo que podría haber venido a lo largo, quizás la próxima vez. Sigue haciendo un gran trabajo!